Although the Chicago Climate Exchange (CCX) collapsed and shut down this week, Al Gore's Generation Investment Management LLP pocketed approximately $17.8 million on it's 2.98% share of the exchange when it was sold to the publicly traded Intercontinental Exchange a mere 6 months ago. According to news reports, the brainchild of the exchange, academic Richard Sandor, founded the exchange with a foundation gift of $1.1 million, and pocketed $98.5 million for his 16.5% share of the CCX. This would place the value of Gore's firm's stake at almost $18 million. Note Gore is the founder, chairman, and largest shareholder in Generation Investment Management LLP. Barack Obama was on the Joyce Foundation Board when it provided the funding to establish the CCX. Maurice Strong, founding head of the United Nations Environmental Program (UNEP), precursor to the IPCC, was a CCX board member. The closing this week of the Chicago Climate Exchange, which was envisioned to be the key player in the trillion-dollar "cap and trade" market, was the final nail in the coffin of the Obama administration's effort to pass the controversial program meant to combat global warming. "It is dead for the foreseeable future," said Myron Ebell, director of the Center for Energy and the Environment with the Competitive Energy Institute, which had fought the measure. That assessment was echoed by environmentalists as well. "Economy-wide cap and trade died of what amounts to natural causes in Washington," said Fred Krupp, president of the Environmental Defense Fund, which had supported the plan. The CCX was set up in 2000 in anticipation of the United States joining Europe and other countries around the world to create a market that would reduce the emission of greenhouse gases. Under the system, factories, utilities and other businesses would be given an emissions target. Those that emitted less fewer regulated gases than their target could sell the "excess" to someone who was above target. Each year, the target figures would be reset lower. The Exchange was the brainchild of Richard Sandor, an economist and professor at Northwestern University, and it was modeled after a successful program that was launched in 1990 and helped control acid rain in the Midwest. It was initially funded by a $1.1 million grant from the Joyce Foundation of Chicago, and President Obama was a board member at the time. After the Democrats won the White House, the House and the Senate in 2008, businesses and investors flocked to the exchange, believing Congress would quickly approve the program. And it almost happened. The House of Representatives passed a bill proposed by Democratic Reps. Henry Waxman of California and Ed Markey of Massachusetts, which would have made cap and trade law. But the Senate couldn't muster the votes, and everything went downhill from there. "When those that voted for the measure in 2009 went home on July 4th after the vote, they met widespread outrage among their constituents," said Nick Loris, an analyst with Heritage Foundation. Conservatives renamed the idea "cap and tax," and they began an assault on the program. In the last week, following the Nov. 2 Republican takeover of the House of Representatives, the slide became an avalanche. Investors in CCX, including Sandor and former Vice President Al Gore, sold the exchange to a company involved in commodities trading. Sale records show that Sandor cleared more than $90 million for his 16 percent stake in the company. Meanwhile, the White House has dropped all references to cap and trade from its web site; and, unlike the heralded climate summit in Copenhagen last year, a 10-day meeting in Mexico beginning Nov. 29 on the next steps to battle global warming has not even mentioned publicly by the administration. But both Loris and Ebell say that isn't necessarily cause for celebrating. "I would like to have a party and say we won, but the truth is were are still in the middle of it," Ebell said. "The problem is now that the administration changed strategy and is using existing laws and regulations, like the Clean Air Act, the Endangered Species Act and EPA regulations to implement its agenda. And unlike the cap and trade effort, it is much harder to get the public excited about rule changes." Republicans in the new Congress, for their part, will try to pass a law "to stop all regulation of greenhouse gases using existing legal authority," Ebell said. "And we are pretty sure we can get 60 votes in the Senate on it." I shook my head when I read about this sale thinking who could be dumb enough to buy the CCX given that COP15 collapsed and the political resistance to cap and trade in the US. I believe that somehow this was a dirty deal at the expense of ICE shareholders. If the stockholders don't sue I would be surprised. "I believe that somehow this was a dirty deal at the expense of ICE shareholders." I believe that some further investigation would reveal that tax payers either in the EU or USA ultimately will pay for the ICE's $600 million purchase of the seemingly worthless CCX. This whole deal stinks to high heaven. A fraud on a massive scale. Al Gore should go to jail. To say that Gore should go to jail is an under-statement. As unbeleivably transparent that the lie is, it is equally unbelievable just how long it took not only to uncover the fraud, but to disseminate the info. Amazing that Gore came so close to getting away with this. Agree that he should go to jail, but not without a public trial, and a long long jail sentence. To be served with a 350-lb'er named Killer. To assert that Man can or could "control" climate... arrogance personified. However... when one throws in "follow the dollar" it does make sense. Fraud and high crimes against humanity comes to mind. By using selected scientific information these clever liars, Global Warming Alarmists, build a false analysis of a complex scientific field. Most people with little or poor scientific education are easily duped especially when emotion and patriotism are linked with phony science to produce a belief system of sorts. These liars are in actuality vicious and cruel monsters. 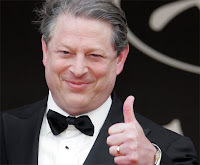 If Al Gore was ever able to attain the global power he wants he would be unrecognizable as the semi-inept benign Vice President he once portrayed to fool the American people. America wake up now!!! As one of my few hero's, Earl Pitts would say, "Wake Up America". This is the best story I have read in a long time! It's a shame that Al Gore was able to make so much money off this (one of many) scam! Here's a question: Goes Gore and the group have investments in Intercontinental Exchange? Did they simply purchase the CCX just to gut any assets? Big Hollywood and the Lame Stream Media continue to push the caricature of big business execs and entrepreneurs (i.e. Gordon Gecho as caricature) as money grubbng crooks, but you'll never hear a peep out of them over mega-crooks like Al Gore and their sugar daddy George Soros. Tarring and feathering, at a minimum, are mandatory. US already bailing out of Cancún? Can Environmentalism Be Saved From Itself?